Hen Parties and coasteering in Wales equals loads of fun and excitement. If you want something really different to do for your Hen Party, then why not try one of our coasteering sessions, these range from easy but fun, to extreme and exhilarating. We offer discount rates for any Hen Party that books our coasteering sessions and we can also recommend great accommodation in Wales, Pembrokeshire and the Gower. All our coasteering sessions in Wales are run with highly experienced, qualified instructors who are particular chosen for having a good sense of humour and an understanding of what Hen Parties want from their coasteering sessions. So if you fancy coasteering in Wales during your Hen Party then give us a call. We can provide your group with all the excitement and fun you could ask for but always ensuring that you are kept safe and secure. To ensure that everyone enjoys themselves, all of the elements in our coasteering sessions (the swims, climbs, jumps etc.) 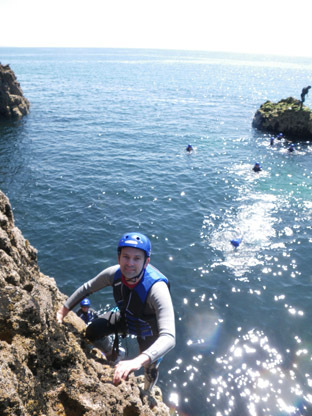 can be shortened or avoided so no-one has to miss out because they are a bit fearful of some part of the coasteering. Our ultimate aim is to give you and your Hen Party the most fun, the most excitement and the best adventure that you have ever had. And don't feel intimidated by the photos, we always start gently and teach you all the techniques that you need along the way. By the time you get to the larger jumps and longer swims you will be more than ready for them and if you feel that you don't want to do a certain challenge then it is easy to avoid or change the route to suit you. So if you want a fantastic Hen Party with the highest quality coasteering in Wales run by hugely experienced outdoor instructors with a great sense of humour, then give us a call. We can also tailor your Hen weekend to suit you, so you can add other activities to your program and mix and match all the activities to get the best Hen Party adventure possible. Have a look at all the other outdoor activities that we offer, just click on the Other Activities link, and then choose the ones that would suit your hen party. Once you have got some ideas together then give us a call and we can give you a discounted quote and sort it all out for you. If you still aren't sure what you want then contact me (Michael Downey) anytime and I can discuss the best options for you and your Hen Party. If coasteering seems too strenuous then we can run a "Team Challenge Event" where your hen party is split into teams with each team competing against each other by solving puzzles, problems and challenges. These can be anything from launching eggs as far as possible using some very basic equipment to being the fastest team to all squeeze a very dodgy sausage. Give us a call if this seems more what you want. During the coasteering sessions we will be taking photos and videos of you and your party at all the best spots whether in Pembrokeshire and the Gower. We will then send you all the pictures to your hen party organiser so that you can relive those moments again and again. If you want to bring your own cameras or camcorders we will use them when we can but it will be at your own risk. So if you want to experience the best hen parties coasteering that Wales, Pembrokeshire and the Gower can offer then contact me for a quote for your Hen Party. I give discounts to large hen parties and can arrange transport to the coasteering venue if you have not already got it organised. Looking forward to coasteering with you in Wales soon. Book now - Call 07854 819142 or 01989 566672 for full details. Thanks for the photos, received them yesterday, there are lots of amusing pictures!!! Thanks also for all of your help to make it such a memorable and enjoyable day, it really was fabulous. Just to say thanks again for the coasteering in Wales on Saturday - everyone really enjoyed it. Although I think there were a few aches yesterday, and they weren't just down to hang overs!! Really looking forward to the photos. we all had a fantastic time coasteering, we really enjoyed ourselves and it was a day full of challenges and laughs. Chris and David were great really supportive whilst teaching us the basics, very patient and good fun to be with. We would all sign up and go coasteering again, it was a fun memorable weekend. I would like to take this opportunity to thank you and Dave for making it such an amazing day for all of us. We have not stopped smiling and talking about the coasteering all weekend. Many thanks for Saturday. We all had a great day & everybody really enjoyed it. Even those a little 'wary'of heights! Would happily recommend you to anybody. Hi Michael Thank you ever so for running the coasteering on Saturday it was a brilliant day and everyone enjoyed it and felt a huge sense of achievement at the end of the day. Everyone really enjoyed the coasteering and Wales is amazing – there was lots of conversation in the evening about doing it again next year! I will send on the email to the girls as most of them are on facebook...... I‘m looking forward to the photos of our terrified faces!! Hi Michael! Thanks for your email, and thanks for a great day. We all thoroughly enjoyed ourselves, and felt that the coasteering had just the right mix of fun and adrenaline to suit everyone in our group. The sense of achievement after climbing across the deep water was incredible! Please pass on my thanks to Tony also - it's great to have instructors who are knowledgeable and have a good sense of humour! I would have no hesitation in recommending you to others - it was a superb choice for my hen do.